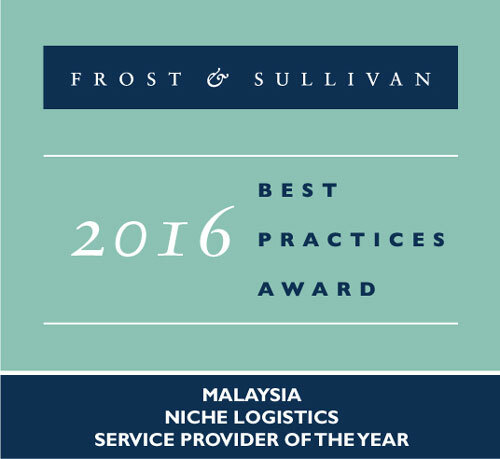 KUALA LUMPUR, - Giga Shipping has been recognised with the 2016 Frost & Sullivan Malaysia Niche Logistics Service Provider of the Year award. The award was presented to Giga Shipping at the 12th annual Frost & Sullivan Malaysia Excellence Awards banquet held at the Grand Hyatt Kuala Lumpur on April 14. Mr. Zainal Izham, Research Analyst, Asia Pacific at Frost & Sullivan said that the recognition demonstrated Giga Shipping’s stellar reputation in the Malaysian logistics industry. “The company’s forte in the supply chain management of automotive companies has been integral to the company due to their facilities and expertise in handling the niche field,” he added. Mr. Zainal also noted that Giga Shipping has made its name as a leading logistics company in Malaysia by focusing on unique services in the logistics industry. “With its 30-year experience in the niche market, Giga Shipping prides itself as one of the pioneers of automotive logistics in Malaysia,” he added. He also said that Giga Shipping’s specialty in handling various types of vehicles, ranging from construction trucks to military armored tanks, exemplifies its high technical capabilities to meet its customers’ needs. “Overall, Giga Shipping has continuously surpassed its successes year after year despite stiff competition from emerging logistics service providers. The company’s new ventures in various business sectors have solidified its position as the leading niche logistics service provider in Malaysia,” Mr. Zainal said. “We are honoured to be recognised by Frost & Sullivan, a reputable global consulting firm. The award is an endorsement from an independent third party consultant that we are on the right track in providing our customers with innovative services in the automotive logistics sector in Malaysia,” said Datuk Kumar Prabakaran, Managing Director of Giga Shipping. “We will continue to deliver reliable services to our clients to help them expand their business,” he added.